50 | TH E M R EP O RT O R I G I NAT I O N S E R V I C I N G A NA LY T I C S S E C O N DA R Y M A R K E T ANALYTICS THE LATEST Which Housing Markets Are Most Affordable? The National Association of Home Builders reported an overall rise in affordability across the nation in the first quarter. 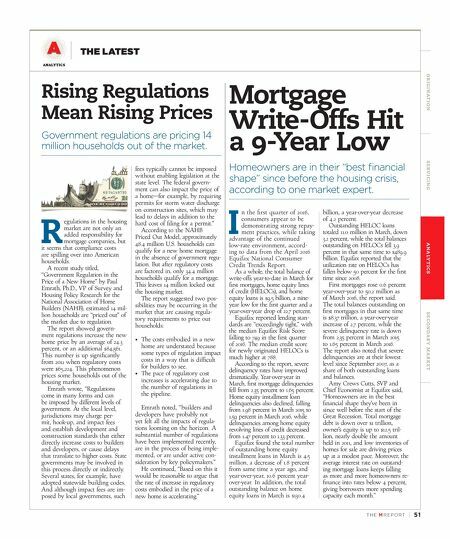 A s mortgage inter- est rates continue to remain at historical lows and home prices stay on favorable ground, hous - ing affordability followed with an increase in the first quarter of 2016. The National Association of Home Builders (NAHB)/Wells Fargo Housing Opportunity Index (HOI) showed 65 percent of new and existing homes sold between the beginning of January and end of March were affordable to families earning the U.S. median income of $65,700. In the fourth quarter of 2015, 63.3 percent of homes were affordable to families earning the median income. The index also showed that the national median home price fell from $226,000 in the fourth quarter to $223,000 in the first quarter. Over the same period, average mortgage rates edged lower from 4.09 percent to 4.05 percent. Youngstown-Warren-Boardman, Ohio-Pennsylvania was rated the nation's most affordable major housing market for the second quarter in a row, NAHB reported. In this market, 93.1 percent of all new and existing homes sold in the first quarter were affordable to families earning the area's median income of $53,900. Syracuse, New York; Indianapolis-Carmel-Anderson, Indiana; Scranton-Wilkes-Barre- Hazleton, Pennsylvania; and Toledo, Ohio wrapped up the top five most affordable major housing markets. Among the smaller housing markets, Cumberland, Maryland- West Virginia was the most affordable small housing market in the first quarter of 2016. In this market, 98 percent of homes sold during the first quarter were affordable to families earning the area's median income of $55,100. 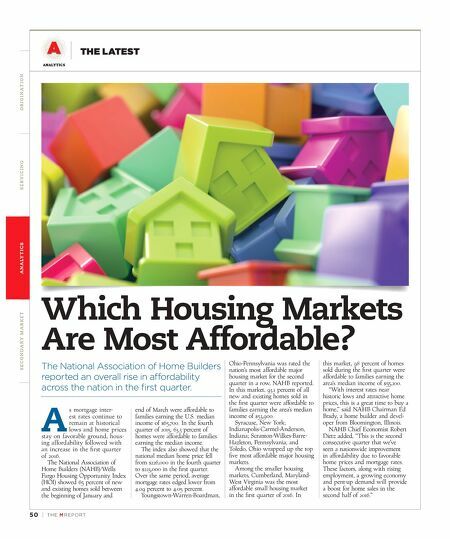 "With interest rates near historic lows and attractive home prices, this is a great time to buy a home," said NAHB Chairman Ed Brady, a home builder and devel - oper from Bloomington, Illinois. NAHB Chief Economist Robert Dietz added, "This is the second consecutive quarter that we've seen a nationwide improvement in affordability due to favorable home prices and mortgage rates. These factors, along with rising employment, a growing economy and pent-up demand will provide a boost for home sales in the second half of 2016."